Zhou Dunyi (Chinese: 周敦颐/周敦頤; Pinyin: Zhōu Dūnyí; Wade-Giles: Chou Tun-yi; 1017-1073 C.E. ), or Zhou Lianxi (周濂溪; Chou Lien-hsi), was a Chinese Neo-Confucian philosopher and cosmologist during the Song Dynasty. He is considered the most important precursor of Neo-Confucianism, the ethical and metaphysical system that became the officially sponsored doctrine in China for almost 1,000 years. 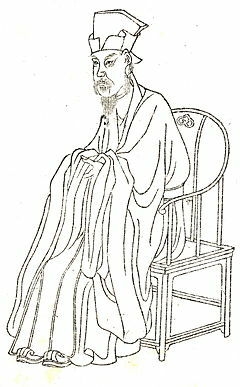 Zhou Dunyi integrated Daoist naturalism with Confucian doctrines to produce a Neo-Confucian cosmology which explained the relationship between human conduct and universal forces and emphasized that humans can master their “qi” ("vital life energy") in order to accord with nature. His best-known text was the brief "Explanation of the Diagram of the Supreme Polarity" which Zhu Xi and Lü Zuqian (1137-1181) placed at the head of their Neo-Confucian anthology, Reflections on Things at Hand (Jinsilu), in 1175. Zhu Xi, the most influential Neo-Confucian philosopher in China, esteemed him as the first Sage of the Song dynasty, and drew significant elements from his system of thought. Chou was born 1017 C.E. into a highly influential family of scholar-officials in Hunan province. When he was about 14, his father died and he was adopted by his maternal uncle, Zheng Xiang, who helped him to obtain his first government position. Though he was very active in his career as a government official, he never passed the civil service examination that would have given him the jinshi (Presented Scholar) degree, and therefore never rose to a high position. He served successively as a magistrate, prefectural staff supervisor, professor of the directorate of education, and assistant prefect before retiring just one year before his death in 1073. He carried on his philosophical work while fulfilling his official responsibilities. Zhou's honorific name, Lianxi ("Lian Stream"), was taken from the study which he built in 1062 at the foot of Mount Lu in Jiangxi province; it was named after a stream in Zhou's home village. In 1200, he was posthumously honored as Yuangong (Duke of Yuan), and in 1241 was accorded sacrifices in the official Confucian temple. During his lifetime, Zhou had no prominence in the intellectual or political life of the Song dynasty, and few, if any, formal students. His nephews, the Cheng brothers, studied with him briefly while they were teenagers. Zhou was remembered by his contemporaries for his warmth and humanity, his appreciation of the natural world, and his penetrating insight into the natural-moral order. To later Confucians, he personified the virtue of "authenticity" (cheng), the full realization of the innate goodness and wisdom of human nature. Zhou’s reputation as the founder of the Cheng-Zhu school of Neo-Confucianism, which dominated Chinese philosophy for 700 years, is based primarily on the tradition of Zhu Xi, who esteemed him as the first Sage of the Song dynasty. According to one version of the Succession to the Way (daotong) given by Zhu Xi, Zhou was the first true Confucian Sage since Mencius (fourth century B.C.E. ), and had influenced the thought of Cheng Hao and Cheng Yi (Zhou's nephews), from whom Zhu Xi drew significant elements of his system of thought. Many Song Confucianists regarded Zhou’s teachings as being Daoist, and his "Explanation of the Diagram of the Supreme Polarity" became part of the Daoist Canon (Daozang). Zhu Xi probably exalted Zhou, ignoring his Daoist connections, because the content of Zhou's teachings supported Zhu's system of thought. Zhou’s works seem to have been relatively obscure until the middle of the twelfth century. Besides those edited by Zhu Xi, the only extant works of Zhou Dunyi are the Taijitu shuo ("Explanation of the Diagram of the Supreme Polarity") in the Daoist Canon and the Tongshu (Penetrating the Classic of Change) in another anthology. Zhou’s works caused the I Ching to be revered as a Confucian classic by Zhu Xi and other Neo-Confucianists of the late Song dynasty. Zhou's short essay, "On the Love of the Lotus" (Ai lian shuo), is still a regular part of the high school curriculum in Taiwan. There are many lovable flowers of grasses and trees both upon the water and on the land. In the Jin Dynasty, Tao Yuanming loved only the chrysanthemum. Since the Tang Dynasty, people of the world have loved the peony very much. I especially love the lotus, which grows out of the dirty mud yet is clean, cleansed by the pure waters but not seductive; its center is void, thus the lotus has vacuity; it grows straight and has no creeping vines and branches; its fragrance is milder in the distance, its stem is erect, slim and clean; it is to be enjoyed from a distance but not too intimately. I say the chrysanthemum is like a recluse while the peony is like a person of high position and wealth; whereas the lotus is like a gentleman. Alas! The love of the chrysanthemum is seldom heard of except for Tao Yuanming; where are the people who, like me, love the lotus? As for those who love the peony, of course there are many! Zhou Dunyi used Taoist doctrines to elaborate on the I Ching, or Book of Changes and develop a metaphysics based on the idea that “the many are [ultimately] one, and the one is actually differentiated into the many.” His best-known text was the brief "Explanation of the Diagram of the Supreme Polarity" which Zhu Xi and Lü Zuqian (1137-1181) placed at the head of their Neo-Confucian anthology, Reflections on Things at Hand (Jinsilu), in 1175. It engendered controversy among Confucians because the diagram explained by the text came from a prominent Daoist master, Chen Tuan (Chen Xiyi, 906-989), and because the key terms of the text had well-known Daoist origins. Zhou may have introduced Daoist terminology in order to show that the Confucian view of humanity's role in the cosmos was compatible with the Daoist worldview, in which human categories and values were thought to alienate human beings from the Dao. According to the I Ching, the process of creation is an evolutionary one in which yin (tranquility) and yang (movement) originate from the Great Ultimate, and through their interaction gives rise to the Five Elements (fire, earth, water, metal, and wood). The integration of these entities gives rise to male and female elements, which in turn generates the production and evolution of all things. Zhou taught that human beings receive all these qualities and forces in their “highest excellence,” and that when man reacts to the external phenomena thus created, the distinction between good and evil emerges in his thought and conduct. Zhu Xi and his school drew from this integration of metaphysics (taiji, which Zhu equated with li, the ultimate naturaland moral order) and cosmology (yin-yang and Five Phases). Zhou’s explanation of the relationship between human conduct and universal forces emphasized that humans can master their “qi” ("vital life energy") in order to accord with nature. Zhu Xi was particularly interested in the concepts of "Supreme Polarity" (taiji), "authenticity" (cheng), and the interpenetration of activity (dong) and stillness (jing). Learning to be a Sage (sheng xue) [Someone asked:] "Can Sagehood be learned?" Reply: It can. "Are there essentials (yao)?" Reply: There are. "I beg to hear them." Reply: To be unified (yi) is essential. To be unified is to have no desire. Without desire one is vacuous when still and direct in activity. Being vacuous when still, one will be clear (ming); being clear one will be penetrating (tong). Being direct in activity one will be impartial (gong); being impartial one will be all-embracing (pu). Being clear and penetrating, impartial and all-embracing, one is almost [a Sage]." Zhou Lianxi ji, 5:38b. In the longer treatise entitled T'ung-shu (“Explanatory Text”), Zhou grounded Confucian ethics in his metaphysical scheme. Zhou explained that the sage, or superior man, reacts to external phenomena in accordance with propriety, humanity, righteousness, wisdom, faithfulness, and tranquility. Zhou viewed sincerity as the foundation of morality, the source of man’s ability to distinguish good from evil, and thus man’s ability to perfect himself. Zhou’s ethical system helped to revitalize and purify Neo-Confucianism. Being a Sage is nothing more than being authentic. Being authentic is the foundation of the Five Constant [Virtues] and the source of the Hundred Practices. It is imperceptible when [one is] still, and perceptible when [one is] active; perfectly correct [in stillness] and clearly pervading [in activity]. When the Five Constants and Hundred Practices are not authentic, they are wrong; blocked by depravity and confusion. Therefore one who is authentic has no [need for] undertakings (shi). It is perfectly easy, yet difficult to practice; when one is determined and precise, there is no difficulty with it. Therefore [Confucius said], "If in one day one could subdue the self and return to ritual decorum, then all under Heaven would recover their humanity. Analects 12:1, referring to the ruler. Zhou Lianxi ji, 5:9a-10a. In being authentic there is no deliberate action (wuwei). In incipience (ji) there is good and evil. As for the [Five Constant] Virtues, loving is called humaneness (ren), being right is called appropriateness (yi), being principled (li) is called ritual decorum (li), being penetrating is called wisdom (zhi), and preserving is called trustworthiness (hsin). One who is by nature like this, at ease like this, is called a Sage. One who recovers it and holds onto it is called a Worthy. One whose subtle signs of expression are imperceptible, and whose fullness is inexhaustible, is called Spiritual (shen). Zhou Lianxi ji, 5:11b-12a. Wang, Robin. 2005. "Zhou Dunyi's Diagram of the Supreme Ultimate Explained (Taijitu shuo) : A Construction of the Confucian Metaphysics." Journal of the History of Ideas. 66 (3):307-323. Wright, Arthur F. 1953. Studies in Chinese thought. Comparative studies in cultures and civilizations. Chicago: University of Chicago Press. Zhou, Dunyi, and Fan-ch'eng Hsü. 1979. The book of universality: a supplement to The book of changes. Pondicherry, India: Sri Aurobindo Ashram Publication Dept. This page was last modified on 3 July 2013, at 14:18.